On April 3, the Milwaukee Bucks defeated the Boston Celtics 106-102 to move to 42-36 on the season, marking the franchise’s first back-to-back winning seasons since 2001. One night later, after the Detroit Pistons dropped a contest to the Philadelphia 76ers, Milwaukee clinched a playoff berth for the second consecutive year, the first time the team had done that since 2004. Finally, on Monday, after 30 years at the intersection of Fourth and State streets, the Bucks played their final regular-season game at the BMO Harris Bradley Center. The 2017-18 season was one of many firsts for the 50-year-old organization, no doubt due in large part to 23-year-old phenom Giannis Antetokounmpo. Aside from the Kareem Abdul-Jabbar era of the 1970s, many would believe that the current incarnation of the team is the best it’s ever been. But that would ignore the magical 2000-01 Bucks season and what Antetokounmpo’s predecessor Ray Allen did for a sports town that had been foundering since the 1980s. On April 12, 2001, Allen scored a career-high 43 points on a career-high eight 3-pointers to help take down the Utah Jazz, 115-93, and push the Bucks to the 50-win mark for the first time in 14 years. The victory secured the No. 2 seed in the playoffs, and outside of questionable calls in their Eastern Conference finals matchup with the Allen Iverson-led Philadelphia 76ers (Allen and the Bucks were fined $85,000 for suggesting the NBA would prefer a 76ers-Los Angeles Lakers NBA Finals), they could have reached the NBA Finals for the first time in nearly 30 years (1973-74). 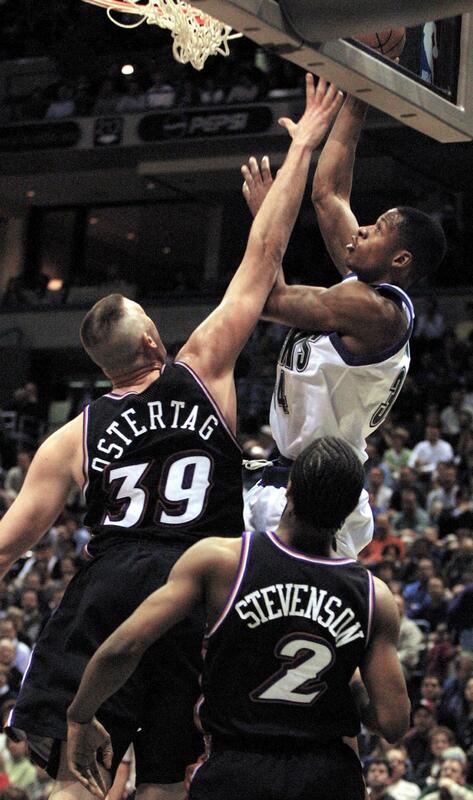 But on that April night at the Bradley Center, Allen was simply unstoppable. The then-25-year-old was an uber-efficient 14-of-23 (60.9 percent) from the field, including 8 of 14 (57.1 percent) on 3-pointers. Allen, in his later seasons with the Seattle SuperSonics, Boston Celtics and Miami Heat (two words: Game 6), was known as a sharpshooter from beyond the arc, but in his Milwaukee prime he was an athletic marvel. Against the admittedly aged Jazz (Karl Malone and John Stockton were a combined 75 years old), Allen was getting buckets coming off screens, pulling up from 25 feet out in transition (as Stephen Curry would replicate some 10 years later), dribble drives and working off isolation plays. At one point, the spry Allen posed as the Air Jordan silhouette before slamming over a handful of Utah defenders. “There were a lot of times when I was going to pass, but they gave me an easy shot, so I took it,” Allen told the Milwaukee Journal-Sentinel. He scored 30 of his 43 points in the first half. “That first half was the best half of basketball I’ve ever had,” he said. This was Allen’s fourth career 40-point game, which included a 42-point outing against the 76ers three months beforehand. He’d end his 17-year career with 13 such games. One day before the Jazz game, the Bucks clinched the Central Division title for the first time since the 1985-86 season, and after that night they won 50 games for the first time since 1986-87. To put that into perspective, Milwaukee hasn’t won 50 games since 2000-01, the closest coming in 2009-10 when the duo of John Salmons and Brandon Jennings led the deer to a 46-36 finish. With the win over Utah, the Bucks ended the regular season with a perfect 8-0 record versus the top four seeds in the Western Conference playoffs (San Antonio Spurs, Lakers, Sacramento Kings, Jazz), the last Eastern Conference team to accomplish that feat, according to ESPN Stats & Information. Allen, who would last just one more full season with the Bucks, told reporters at the time that he was most proud of being able to bring winning basketball back to the Cream City. “The people who have supported us for so long have seen some bad basketball, and it’s great to reward all those people with a division championship,” he said.